Noonan Building artists are opening their studios to the general public this year as part of San Francisco’s annual Open Studio event. Our building always seems to be one of the standout locations during Open Studios. The waterfront location and quality of our artists make it a great visit for art lovers and art buyers looking for a unique San Francisco art experience. The Noonan Building will be open during Weekend 2 of this year’s event, Saturday, October 25, and Sunday, October 26, from 11am to 6pm. Many of the artists participating in this year’s event are listed in the poster above. The organizers of the event, Artspan, have a web site where you can get more information (click here). To get directions to the Noonan Building, visit our contact page and click on the red marker in the center of the map. We invite everyone who has an interest in keeping San Francisco’s art scene vibrant and engaging to visit the Noonan Building this year during our Open Studios weekend! In what we are sure will be a new tradition going forward, many of us from the Noonan Building got together for a little holiday cheer on Wednesday, Dec. 18, at Hogan's Goat Tavern. And while it was a bittersweet night for owner Christopher (he's closing at the end of the month), clearly a good time was had by everyone. And to our fellow Noonan comrades who were unable to attend, you sadly were missed. But, we toasted to you in spirit — lots of spirit to be exact. Many thanks to Julia and Gil from the New Spot, for their great tortilla chips, guacamole and salsas. Photos in the gallery below (click on "continue reading" to view) by Kim Frohsin and main photo above by David Magnusson. The Noonan Building Artists are happy to announce our participation in San Francisco's annual Open Studios event. Our building always seems to be one of the standout locations during Open Studios. The waterfront location and the number and quality of our artists makes it a great visit for art lovers, art buyers, gallery owners on the prowl for good work and curious members of the public looking for a unique San Francisco art experience. Our building will be open during Weekend 3 of this year's event, Saturday, November 2, and Sunday, November 3, from 11am to 6pm. Many of the artists participating in this year's event are listed in the poster above. The organizers of the event, Artspan, have a web site where you can get more information (click here). To get directions to the Noonan Building, visit our contact page and click on the red marker in the center of the map. We invite everyone who has an interest in keeping San Francisco's art scene vibrant and engaging to visit the Noonan Building this year during our Open Studios weekend! The Noonan Building Artists have just launched their own Facebook page to facilitate the work of the group and to allow us to communicate more easily with the public at large. All Noonan Building artists should go to Facebook and do all the liking and friending and social networking you can to get us connected with our community. Our hope is that the page can become a useful forum for us. Note that any entries in our blog will automatically be linked to an entry on our Facebook page. Here, for everyone's enjoyment, is the Noonan Building Artist group portrait, taken (as are all the individual artist portraits on this site) by our own David Magnusson. The photo was taken after the close of our last Open Studio event on April 28, which was a part of the Port of San Francisco's 150th Anniversary celebration. About two-thirds of the artists in the building were in the house that day. 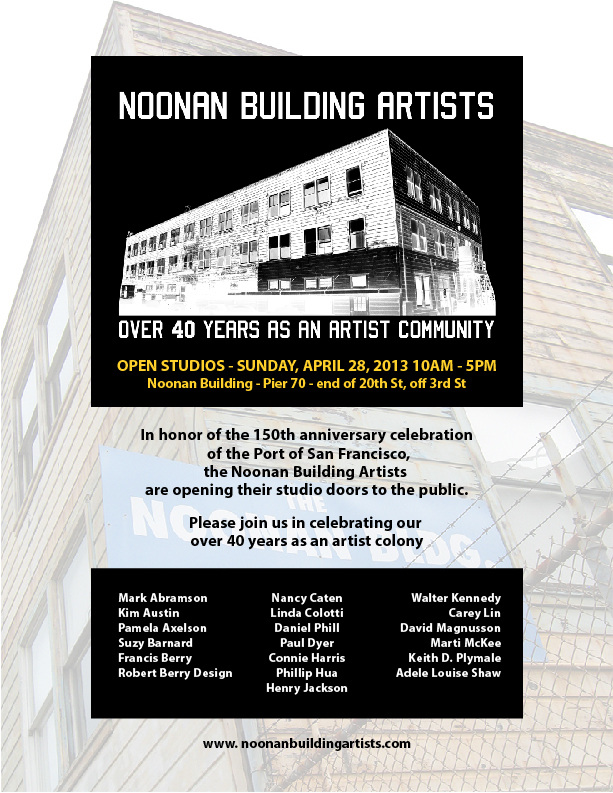 The Noonan Building artists will be holding an Open Studio event this Sunday, April 28, as a part of the Port of San Francisco's 150th Anniversary celebration. A number of the artists in the Building will be opening their doors to give the public an inside look at one of the hidden gems of the Port and the City of San Francisco – the Noonan Building Artists community. Our building is home to painters, printmakers, photographers, filmmakers, writers, musicians and more. We have a truly fascinating group of characters here, and if you're out and about this Sunday, checking out the other waterfront activities, this chance to meet the Noonan Building artists is not to be missed. This Open Studio event is part of the Ports "Maritime Day on the Waterfront" a daylong public celebration of events and activities along the waterfront from Hyde Street Pier in the north to Heron’s Head Park (Pier 98) in the south. Other activities will include public boat tours, bicycle tours, exhibits, lectures, public tours, a film festival, and interpretive displays. Our studios will be open from 10 am through 5pm. For directions, go to the contact page on this site. This flyer was created by Noonan Building artist Henry Jackson, to serve as an email notification announcing our upcoming April 28th, 2013 Open Studios. If you would like to download a copy of this flyer to send to friends and family, click here for a PDF. This design was created by Noonan Building artist Phillip Hua, for our brand-new, never-been-done, first ever, Noonan Building Artists T-shirt! These t-shirts will be available on time to coincide with our April 28th, 2013 Open Studios. If you have not done so already, please get in touch with Henry to place your order.